Boats Under 16' with Anchors Under 20 lbs. Boats Over 16' with Anchors Less Than 30 lbs. Boats Over 16' with Anchors Over 30 lbs. Welcome to the Anchor Wizard website! Aside from the dreaded monthly payment, nothing in the boating world is despised more than having to toss and retrieve your anchor….hand over hand - again and again and again. If you are looking for a better and EASIER way to anchor your boat, you have come to the right place! It's time to, "Stop Yanking and Start Cranking"! Anchor Wizard anchoring systems are THE ANCHORING SOLUTION for any boat, and our desire is to help you find the right system for your style of boat and preferred anchor weight. START by clicking on your boat style under the Choose Boat Style column on the left side of the website. From there you will be directed to a page that shows you which Anchor Wizard unit (or choice of units) will work best for you. It's as simple as that! 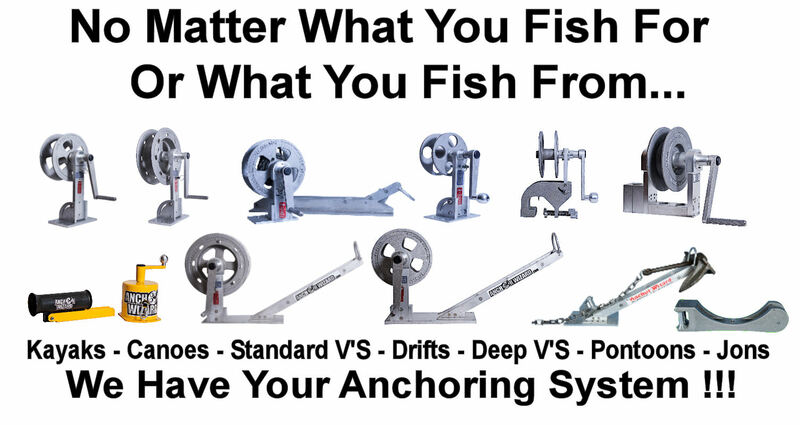 Whether you're a professional fishing guide who fishes hard for your clients five or six days a week, or just a regular weeknight/weekend angler like the rest of us - our anchoring systems were built to last and designed to take all of the work out of anchoring. Anchor Wizard. We Make Anchoring EASY!